The next time you watch the NBA on TV, you might notice that pregame rituals look a little different, and apparently, that’s no accident: The Italian food company Barilla is now paying some of the NBA’s biggest names to hold a bunch of raw pasta in their hands as they warm up for games. Step aside, Beats by Dre, because THIS is how you sponsor athletes! 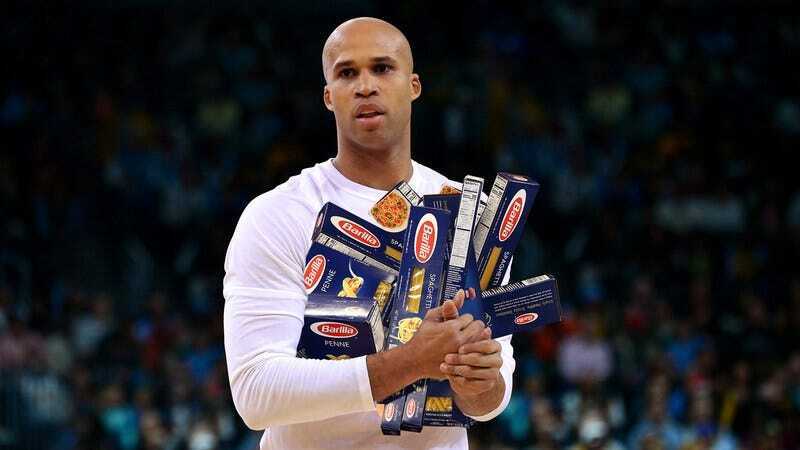 According to Barilla’s marketing department, NBA players have already received large, undisclosed amounts of money for holding fistfuls of uncooked pasta in front of cameras during their pregame warmups. From the moment they step foot on the court, players have been asked by Barilla to prominently display several dry strands of fettuccine or angel hair pasta while they run suicides, practice layups, and stretch until the game begins. Whoa. It sure sounds like Barilla is ready to become the next big accessory for basketball superstars. Even after the games are over, entire teams including the Houston Rockets and the Miami Heat have been seen clenching fists full of fusilli in the locker room, and long sheets of lasagna during interviews—so, needless to say, Barilla’s investment strategy is already paying off! With companies doing anything and everything to grow their brands, this sure seems like an awesome way for Barilla to reach a larger audience. So the next time you watch a player dunk during warmups, look at their hand for a full serving size of dry pasta—you just might get a glimpse of integrated marketing greatness!